Lewis: You w- you wanna... you wanna talk about the vanishing wilderness? Bobby: Lewis, listen - what are you so anxious about this? Lewis: Because they're buildin' a dam across the Cahulawassee River; they're gonna flood a whole valley, Bobby, that's why. Dammit, they're drownin' a river; they're drownin' a river, man. Q: Why did Ed ditch the shotgun and the bow and arrows? Q: Why does Drew suddenly fall out of the canoe? Q: How did the hillbilly that was up on the cliff with Ed end up with an arrow in his shoulder and then collapse dead? Ed clearly did not have time to pull the arrow out of his side and put in his bow and pull back. After having seen Deliverance, movies like Pulp Fiction don't seem so extreme. Maybe by today's blood and bullets standards it doesn't seem so edgy, but if you think that this was 1972 and that the movie has a truly sinister core then it makes you think differently. When I started watching this movie nothing really seemed unusual until I got to the "Dueling Banjos" scene. In that scene the brutality and edge of this film is truly visible. As I watched Drew(Ronny Cox,Robocop)go head to head with a seemingly retarted young boy it really shows how edgy this movies can get. When you think that the kid has a small banjo, which he could of probably made by hand, compared to Drew's nice expensive guitar, you really figure out just how out of their territory the four men are. As the plot goes it's very believable and never stretches past its limits. 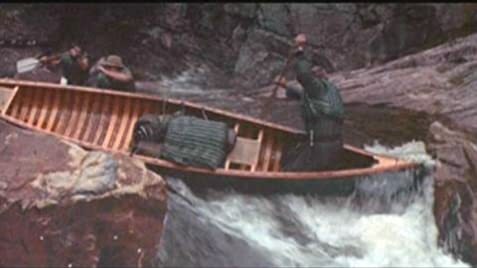 But what really distinguishes this film, about four business men who get more than they bargained for on a canoe trip, is that director John Boorman(Excalibur) breaks all the characters away from plain caricatures or stereotypes. So as the movie goes into full horror and suspense I really cared about all four men and what would happen to them. The acting is universally excellent. With Jon Voight(Midnight Cowboy, Enemy of the State) and Burt Reynolds(Boogie Nights, Striptease) leading the great cast. Jon Voight does probably the hardest thing of all in this film and that is making his transformation from family man to warrior very believable. Unlike Reynolds whose character is a warrior from the start, Voight's character transforms over the course of the movie. Ned Beatty(Life) is also good in an extremely hard role, come on getting raped by a hillbilly, while Ronny Cox turns in a believable performance. One thing that really made this movies powerful for me is that the villains were as terrifying as any I had ever seen. Bill Mckinney and Herbert "Cowboy" Coward were excellent and extremely frightening as the hillbilly's. 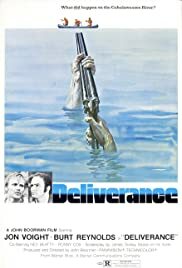 Overall Deliverance was excellent and I suggest it to anyone, except for people with weak stomachs and kids. 10/10. See this movie. 123 of 161 people found this review helpful. Was this review helpful to you?